About 20–25 million residents (3%)[ year needed] are members of diasporas of non-European origin. The population of the European Union, with some five hundred million residents, accounts for two thirds of the European population. Balkans: Illyrians ( List of ancient tribes in Illyria), Dacians, and Thracians. Western/ Central Europe: Celts ( list of peoples of Gaul, List of Celtic tribes), Rhaetians and Swabians, Vistula Veneti, Lugii and Balts. Iberian peninsula: Pre-Roman peoples of the Iberian Peninsula ( Iberians, Lusitani, Aquitani, Celtiberians) Basques and Phoenicians ( Carthaginians). West European Isles: Celtic tribes in Britain and Ireland and Picts/ Priteni. Northern Europe: Finnic peoples, Germanic peoples ( list of Germanic peoples); the Normans conquered and colonized South Italy and Sicily ( Norman conquest of southern Italy). 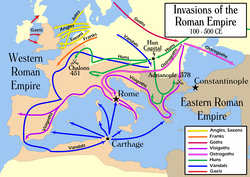 the Jewish diaspora reached Europe in the Roman Empire period, the Jewish community in Italy dating to around AD 70 and records of Jews settling Central Europe ( Gaul) from the 5th century (see History of the Jews in Europe). the Bulgars (or Proto-Bulgarians), a semi- nomadic people, originally from Central Asia, eventually absorbed by the Slavs. the Mongol/ Tatar invasions (1223–1480), and Ottoman control of the Balkans (1389–1878). These medieval incursions account for the presence of European Turks and Tatars. Gottfried Hensel in his 1741 Synopsis Universae Philologiae published what is probably the earliest ethno-linguistic map of Europe, showing the beginning of the pater noster in the various European languages and scripts. In the 19th century, ethnicity was discussed in terms of scientific racism, and the ethnic groups of Europe were grouped into a number of " races", Mediterranean, Alpine and Nordic, all part of a larger " Caucasian" group. Ashkenazi Jews: approx. 1.4 million, mostly in the United Kingdom, Germany, France and Ukraine. 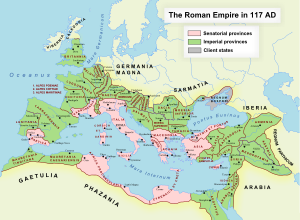 They are believed by scholars to have arrived from Israel via southern Europe      in the Roman era  and settled in France and Germany towards the end of the first millennium. The Nazi Holocaust wiped out the vast majority during World War II and forced most to flee, with many of them going back to Israel. Sephardi Jews: approx. 0.3 million, mostly in France. They arrived via Spain and Portugal in the pre- Roman  and Roman  eras, and were forcibly converted or expelled in the 15th and 16th centuries. North Africans ( North African Arabs, Egyptian Copts, and Berbers): approx. 5 million, mostly in France, Spain, Italy, the Netherlands and Sweden. The bulk of North African migrants are Moroccans, although France also has a large number of Algerians, and others may be from Egypt (including Copts), Libya and Tunisia. Horn Africans ( Somalis, Ethiopians, Eritreans, Djiboutians, and the Northern Sudanese): approx. 700,000, mostly in Scandinavia, the UK, the Netherlands, Germany, Switzerland, Austria, Finland, and Italy. Majority arrived to Europe as refugees. Proportionally few live in Italy despite former colonial ties, most live in the Nordic countries. Romani (Gypsies): approx. 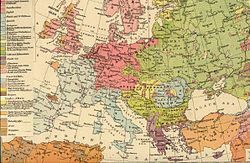 4 or 10 million (although estimates vary widely), dispersed throughout Europe but with large numbers concentrated in the Balkans area, they are of ancestral South Asian and European descent,  originating from the northern regions of the Indian subcontinent. African Americans (i.e. African American British) who are Americans of black/African ancestry reside in other countries. In the 1920s, African-American entertainers established a colony in Paris ( African American French) and descendants of World War II/Cold War-era black American soldiers stationed in France, Germany and Italy are well known. Medieval notions of a relation of the peoples of Europe are expressed in terms of genealogy of mythical founders of the individual groups. The Europeans were considered the descendants of Japheth from early times, corresponding to the division of the known world into three continents, the descendants of Shem peopling Asia and those of Ham peopling Africa. Identification of Europeans as " Japhetites" is also reflected in early suggestions for terming the Indo-European languages "Japhetic". Berting says that these points fit with "Europe's most positive realisations". The concept of European culture is generally linked to the classical definition of the Western world. In this definition, Western culture is the set of literary, scientific, political, artistic and philosophical principles which set it apart from other civilizations. Much of this set of traditions and knowledge is collected in the Western canon. The term has come to apply to countries whose history has been strongly marked by European immigration or settlement during the 18th and 19th centuries, such as the Americas, and Australasia, and is not restricted to Europe. In modern times, significant secularization since the 20th century, notably in laicist France, Estonia and Czech Republic. Currently, distribution of theism in Europe is very heterogeneous, with more than 95% in Poland, and less than 20% in the Czech Republic and Estonia. 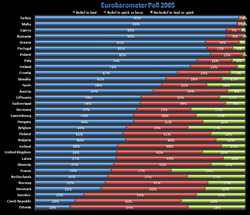 The 2005 Eurobarometer poll  found that 52% of EU citizens believe in God. Pan and Pfeil (2002) distinguish 33 peoples which form the majority population in at least one [l] sovereign state geographically situated in Europe. [m] These majorities range from nearly homogeneous populations as in Armenia and Poland, to comparatively slight majorities as in Latvia or Belgium, or even the marginal majority in Bosnia and Herzegovina. Montenegro is a multiethnic state in which no group forms a majority. Azerbaijan [o] Azerbaijanis 91.6% Lezgin 2% Armenians, Russians, Talysh, Avars, Turks, Tatars, Ukrainians and Poles. Denmark Danes 90%  Faroese other Scandinavian, Germans, Frisians, other European, Greenlandic people and others. Estonia Estonians 68% Baltic Russians 25.6% Ukrainians 2.1%, Belarusians 1.3%, Finns 0.9%, and other ( Baltic Germans, Estonian Swedes and Estonian Danes) 2.2%. (2000 census) Included are South Estonian speakers. Kosovo [q] Albanians 92% Serbs 4% other 4% ( Bosniaks, Gorani, Romani, Turk and Ashkali and Egyptians). Moldova Moldovans [r] 75.1% Gagauzs 4.6%, Bulgarians 1.9% Romanians [r] 7%, Ukrainians 6.6%, Russians 4.1%, and other 0.8% (2014 census). Serbia [u] Serbs 83% Hungarians 3.9%, Romani 1.4%, Yugoslavs 1.1%, Bosniaks 1.8%, Montenegrin 0.9%, and other 8%. i.e. Macedonians, Slovaks, Romanians, Croats, Ruthenes, Bulgarians, Germans, Albanians, and other (2002 census). Slovenia Slovenes 83.1% Serbs 2%, Croats 1.8%, Bosniaks 1.1%, other ( Dalmatian Italians, ethnic Germans, Hungarians and Romanians) and/or unspecified 12% (2002 census). Spain Spaniards 89% Various nationalities and sub-ethnicities, including Castilians and Leonese, Catalans/ Valencians, Galicians, Asturians, Basques Gypsies, Jews, Latin Americans, Romanians, North Africans, sub-Saharan Africans, Chinese, Filipinos, Levant Arabs, British expatriates, and others. Turkey [o] Turks 75% Kurds 18% Other 7%: Zaza, Laz, Jews, Greeks, Georgians, Circassians, Bulgarians, Bosniaks, Assyrians, Armenians, Arabs, Albanians and Romanians. Ukraine Ukrainians 77.8% Russians 17.3% Belarusians 0.6%, Moldovans [v] 0.5%, Crimean Tatars 0.5%, Bulgarians 0.4%, Hungarians 0.3%, Romanians [v] 0.3%, Poles 0.3%, Jews 0.2%, Armenians 0.1%, Urums 0.1% and other 1.8% (2001 census). United Kingdom White [w] British 81.9% [x] (consisting of English: ca. 75-80% Scottish: 8.0%, Welsh: approx. 4.5%, Northern Irish (could also be counted as Irish): 2.8%, also Cornish, Manx and Channel Islanders). Included are the inhabitants of Gibraltar. African British, Asian British often consists of South Asian and East Indian peoples, Chinese British, British Jews, Romani, various other Commonwealth Citizens and other Europeans, particularly Irish, Poles, French among others. ^ Ethnic groups which form the majority in two states are the Albanians (in Albania and the partly recognized Republic of Kosovo). Also to note is that Luxembourg has a common ethnonational group, the Luxembourgers of partial Germanic, Celtic and Latin (French) and transplanted Slavic origins. There are two official languages: French and German in the relatively small country, but the informal everyday language of its people is Letzeburgesch. Closely related groups holding majorities in separate states are German speakers ( Germans, Austrians, Luxembourgers, Swiss German speakers), the various South Slavic ethnic groups in the states of former Yugoslavia, the Dutch/ Flemish, the Russians/ Belarusians, Czechs/ Slovaks and the Bulgarians/ Macedonians. ^ see e.g. Genetic evidence for different male and female roles during cultural transitions in the British Isles doi: 10.1073/pnas.071036898 PNAS 24 April 2001 Vol. 98 No. 9 5078–5083. ^ Günther, Torsten; et al. (2015). "Ancient genomes link early farmers from Atapuerca in Spain to modern-day Basques" (PDF). Proceedings of the National Academy of Sciences. 112 (38): 11917–11922. Bibcode: 2015PNAS..11211917G. doi: 10.1073/pnas.1509851112. PMC 4586848. PMID 26351665. Retrieved 2 November 2016. ^ Hammer, M. F; Redd, A. J; Wood, E. T; Bonner, M. R; Jarjanazi, H; Karafet, T; Santachiara-Benerecetti, S; Oppenheim, A; Jobling, M. A; Jenkins, T; Ostrer, H; Bonne-Tamir, B (2000). "Jewish and Middle Eastern non-Jewish populations share a common pool of Y-chromosome biallelic haplotypes". Proceedings of the National Academy of Sciences. 97 (12): 6769–6774. Bibcode: 2000PNAS...97.6769H. doi: 10.1073/pnas.100115997. PMID 10801975. Retrieved 11 October 2012. ^ Costa, Marta D.; Pereira, Joana B.; Pala, Maria; Fernandes, Verónica; Olivieri, Anna; Achilli, Alessandro; Perego, Ugo A.; Rychkov, Sergei; Naumova, Oksana; Hatina, Jiři; Woodward, Scott R.; Eng, Ken Khong; Macaulay, Vincent; Carr, Martin; Soares, Pedro; Pereira, Luísa; Richards, Martin B. (8 October 2013). "A substantial prehistoric European ancestry amongst Ashkenazi maternal lineages". Nature Communications. 4: 2543. Bibcode: 2013NatCo...4E2543C. doi: 10.1038/ncomms3543. PMC 3806353. PMID 24104924. Retrieved 12 December 2017 – via www.nature.com. ^ Lazaridis, Iosif; Patterson, Nick; Mittnik, Alissa; Renaud, Gabriel; Mallick, Swapan; Kirsanow, Karola; Sudmant, Peter H; Schraiber, Joshua G; Castellano, Sergi; Lipson, Mark; Berger, Bonnie; Economou, Christos; Bollongino, Ruth; Fu, Qiaomei; Bos, Kirsten I; Nordenfelt, Susanne; Li, Heng; Cesare de Filippo; Prüfer, Kay; Sawyer, Susanna; Posth, Cosimo; Haak, Wolfgang; Hallgren, Fredrik; Fornander, Elin; Rohland, Nadin; Delsate, Dominique; Francken, Michael; Guinet, Jean-Michel; Wahl, Joachim; et al. (2013). "Ancient human genomes suggest three ancestral populations for present-day Europeans". Nature. 513 (7518): 409. arXiv: 1312.6639. Bibcode: 2014Natur.513..409L. doi: 10.1038/nature13673. ^ Kalaydjieva, L; Gresham, D; Calafell, F (2001). "Genetic studies of the Roma (Gypsies): a review". BMC Med. Genet. 2: 5. doi: 10.1186/1471-2350-2-5. PMC 31389. PMID 11299048.